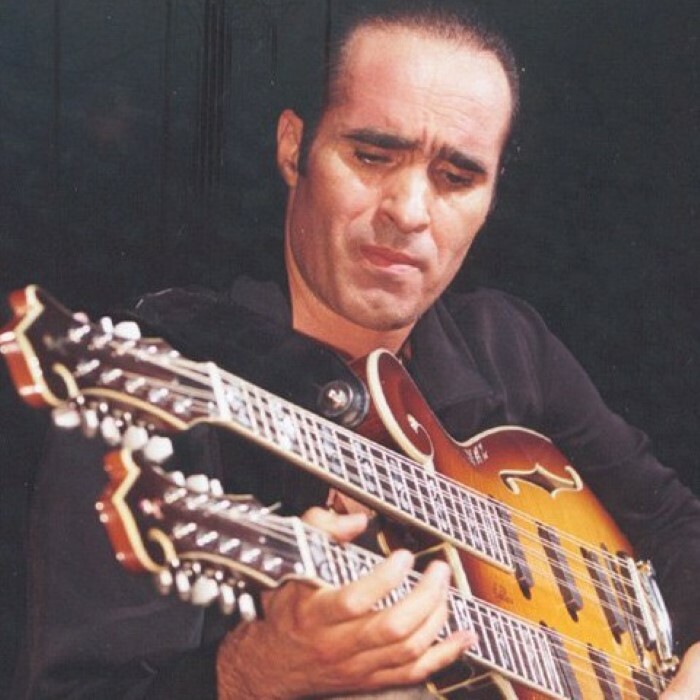 Takfarinas (born Ḥsen [Hassen] Zermani in Algiers, Algeria) is the stage name of an Algerian Kabyle Yal musician who was born in 1958. Takfarinas took his surname from the ancient warrior of North Africa Tacfarinas who fought against the presence of the Romans in Algeria. Since 1979 Takfarinas has lived in France. However, his songs promote and celebrate the Kabyle culture into which he was born. Takfarinas is perhaps best known for his voice which covers a wide range and the 'takfa' which is based on a traditional lute like instrument which he has modified by adding a second neck. Each neck provides a distinct sound, one neck is feminine and the other masculine. Nowadays the takfa has been replaced by an electric half-drum mandole. Like the takfa this has two fingerboards. The advantage of this new instrument is that it is able to create the large concert sound which he now needs. The Kabyle are a musical people with a love of music and poetry. The culture is an oral one and depended on song to transmit ideas and the culture. This is still evident today even though more Kabyle can read and write their own language. Takfarinas - or Tak as his fans often call him - comes from a long line of musicians and showed his future innovative skills with musical instruments when aged only six years old he made a guitar using an oil cylinder and brake cable. As a youngster, Takfarinas was interested in the music of artists like Chaâbi, M' Hamed El Anka, Sheik El Hasnaoui and Slimane Azem. In 1976, he recorded his first music on cassettes in Algiers, but his position as a singer and musician was strengthened when he recorded his first album in France in 1979. In 1981, he formed the group Agraw with Boujema Semaouni that lasted for many years. He released Wa i telha and Arrach both in 1986, selling a million copies. In 1989, he released Irgazen and Mi d ih, a double CD, and this brought him international recognition. In 1994, he released another album Yebb'a rremman which did well in the European charts. But it is with his album Zaâma Zaâma and the title song from the album that he achieved his biggest recognition. It remains a world music favorite in clubs and in touristic resorts where the dance tune is popular with accompanying synchronized dance moves. Takfarinas changed musical direction with his album Paix et salut which was in homage to the Algerian artists who were victims of the repression. Then in 2004, he released his latest album Honneur aux dames.